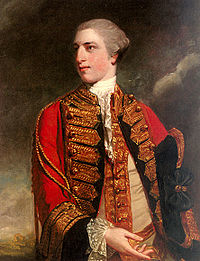 The second son of Lord Augustus FitzRoy and a grandson of the 2nd Duke of Grafton, FitzRoy joined the 1st Regiment of Foot Guards as an ensign in 1752. He fought at the Battles of Minden and Kirchdenkern during the Seven Years’ War and rose to the ranks of Captain in 1756 and Lieutenant-Colonel in 1758. On 27 July 1758, FitzRoy married Anne Warren, the daughter and co-heir of Adml. Sir Peter Warren and they later had seven children. He was a Groom of the Bedchamber from 1760–62 and Whig MP (later Tory from 1770–83 and thereafter a Whig again) for Orford from 1759–61, for Bury St Edmunds from 1761–74 and for Thetford from 1774-80. On leaving the post of Queen Charlotte’s Vice-Chamberlain in 1780 (a post he had held since 1768), he was created Baron Southampton that year and was succeeded by his eldest son, George, upon his death in 1797. His second son, Charles FitzRoy, was romantically linked to King George III’s daughter Princess Amelia.